Ohai. Professor Kitteh here to explain the topic of general relativity, in particular the concept of space-time curvature. Wow, that is a remarkably succinct explanation. Thanks, Prof. Kitteh! We’ll ace that physics test now. 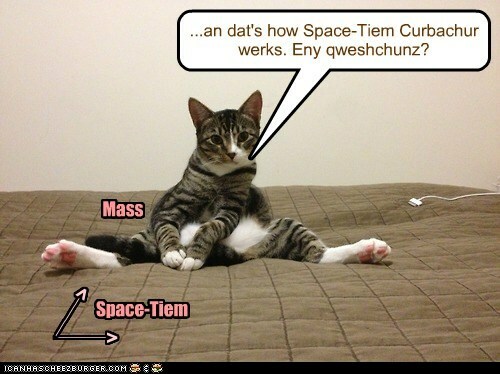 This entry was posted in Science Caturday and tagged general relativity cat, Physics lolcat, science kitteh, science lolcat, space-time curvature cat. Bookmark the permalink.